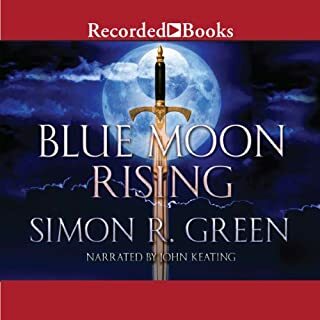 New York Times best-selling author Simon R. Green has crafted numerous acclaimed science-fiction and fantasy novels, including Blue Moon Rising, Blood and Honor, and Shadows Fall. In this first installment of the Ghost Finders series, JC Chance, Melody Chambers, and Happy Jack Palmer are agents of the Carnacki Institute - a place where the sole purpose is to “do something” about ghosts. But what exactly? When Toby Dexter falls for the woman on the train, the woman with the most perfect mouth in the world, he little realises that she isn't quite human: She lives in the magical world that exists alongside our own. And when he follows her to ask her out, he accidently slips from his own world, Veritie, into hers. She warns him that it's a dangerous thing to be a mortal in the magical world of Mysterie and that he must not fall in love with her: She's much older than she looks and mortal must not love immortal. 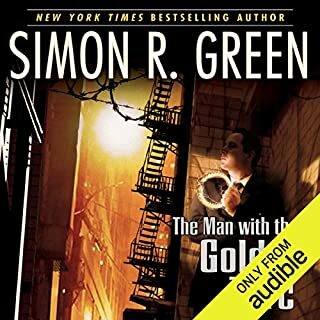 ©1994 Simon R. Green (P)2012 Audible, Inc. Excellent book and a wild ride! I have listened to all of the author's Nightside books as well as his Secret Histories. I was expecting the same writing style in Shadows Fall and a continuation of the descriptions of Shadows Fall as described in the Nightside books. 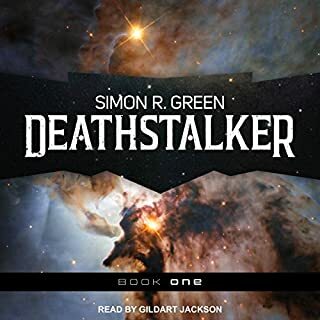 For the first two chapters I did not think much of the book or the reader because I was expecting a Nightside connection that was not there. By the third chapter the book and the reader became excellent. I was totally drawn in and couldn't stop listening. I listen in my car and found myself inventing places to go just so I could listen to the book. The readers range of voices and characters is amazing and it is easy to tell the characters apart by the voices. He does male voices, female voices and accents. All of Simon R. Greens books have some horror and violence tempered with tongue in cheek humor to soften it. Not so in this book. This book is more Simon R. Green meets Stephen King. The book does contain Greens's usual whimsical characters but once it gets going the horror and violence are unrelenting and graphic. If nothing in the Nightside series has disturbed you then you will be fine with this book. 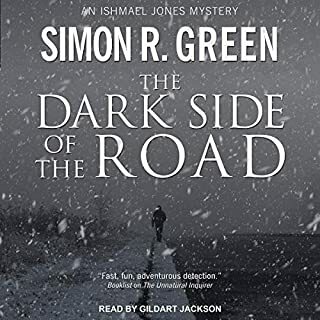 Highly recommended for the Simon R. Green fan. Also recommended if you have never listened to Green as the book stands on it's own. If you are a Christian who offends easily do not buy this book, I'm sure an offended Christian listener will post a review going into more detail but I will not. Great book, is it going to be a series? What made the experience of listening to Shadows Fall the most enjoyable? I liked hearing about this other place that has been referred to in other Simon Greene stories. It was a fast pace and fun story. I am kinda hoping that this is going to be another series. The characters were very interesting. I liked how the author developed them. The narrator added alot to this book. Each character was distance and had its owned personality. I liked this book and I wanted to keep listening to it. I found myself taking a longer walk or lunch or the long way home to keep listening. The setup of this book was great - It's about a town where dreams and fictional characters come to die. So many possibilities. Stop and think of all of the cool stuff that could be done here. However, nothing interesting or exciting does happen, and while there are some interesting characters throughout, their efforts are hugely wasted on a story that's hard to keep track of, and gets duller and duller with every hour. 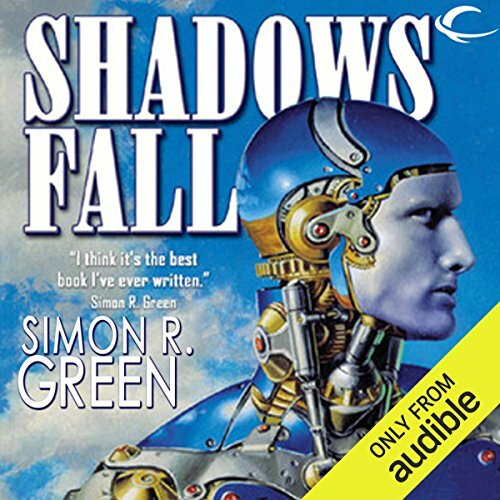 Shadows Fall is one of my favorite Simon R. Green books. I have read it about 5 times since I first brought it many years ago. I find myself buying new copies as I keep loaning out my current copy. What a pleasure that the audible version is just as good as the written work. The narration is wonderful. All the characters are clearly delineated. And the pacing is wonderful. I have a new way to enjoy this thoughtful, fanciful, evocative work. A bit far out even for Simon R Green! 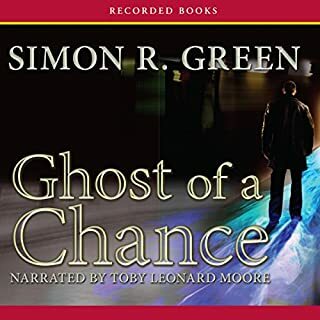 Would you ever listen to anything by Simon R. Green again? Yes, I have enjoyed his Secret Histories series featuring Eddie Drood and his golden armor very much. Just a little too far out there even for a Green fan...I tried, but just couldn't get into the whole story line.. gave up about an hour in. Disappointing, but even Simon R Green can't bat 1000 for everyone! Not sure what I was looking for, but this wasn't it. I kept waiting for the story to really take off and go. But that never really happened. In the end, I was just kind of disappointed with the whole thing. I've been a fan of Green's other works, I saw a few people who said this was one of his best, and this one was getting good reviews... I think I expected something I didn't get. There wasn't anything particularly wrong with the narration or the story, I was just not feeling this one. Story is good but the performance was not. The fault may be the editor, there was no pause between paragraphs, the story seemed to leapfrog into another cast of characters within the sentence, made the story very disjointed. I was disappointed. Would you try another book from Simon R. Green and/or Kevin Stillwell? I Jonesed for every new Nightside book and I liked the Secret Histories, making this book such a let down. I couldn't finish it. I suggest Green fans try the Ghost Finders series after the two mentioned above. I don't recommend this book. Would you be willing to try another one of Kevin Stillwell’s performances? As for the narrator, his performance did not enhance the plot. Bad chemistry? I don't know. 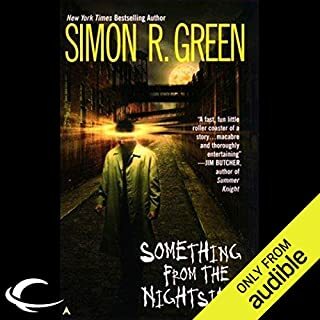 Simon R green is and still will be one of my favorite Writers .His work on the night side collection is still one of my favorite series and the fact that shadow falls as a stand alone book that was tied into the night side series is awesome .Thank you again Mr. Simon R green And Kevin stillwell for a great book . I'm a fan of Simon r green, love his forest kingdom books, hawk and Fisher, drood books and sci fi like, hell world, mist world etc. I've always found the pace, imagination and humour of his books to be great entertainment. which is why this was such a disappointment, just not up to Mr greens usual standard. the narration not done well, in a lifeless bored tone that puts you to sleep and makes you loss focus on what is already a mediocre book.